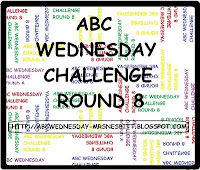 My entry for this week's letter at ABC Wednesday is my Uncle who served during the WW2 and died in Germany. Uncle Paul never made it home and I couldn't even imagine how painful it was for my grandmother to lost a son. Not to mention that she also lost two sons due to a car accident. Two of my Uncles died in a car wreck together. It must be so heartbreaking for my Dad's parents. 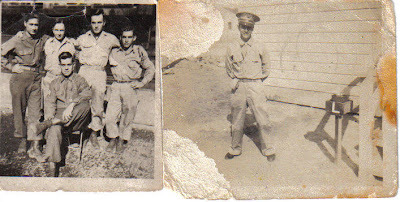 Below is an old photo of my Dad and his friends during their military services. I couldn't find a picture of my Uncle Paul. That sad, I am sorry. On a happy not would you like to join me for a party. Just reminding everyone of my blogger buddies that this Friday through Sunday I will be having my first ever link party. Any link is welcome. Come strut your stuff. You can find the button for the party on my blog now if you would like to grab it. I sure hope to see you there. Loosing family members is always heartbreaking. I enjoyed seeing your vintage photos. I share my post today with you about Uncles. . .but he made it out and saved my life. So many young men lost their lives. How heartbreaking to lose three sons, no matter the means. and beautiful old black and white photos! Wow. My husband was in the military and I don't know what I would have done if he didn't come home. Hi! Just stopping by. Following you from the Thursday Cup of Joe Blog Hop. Would love a visit and follow back on my blog: http://blog.writerslairbooks.com. Thanks! visiting from the blog hop. I'm already a follower. I love old pictures. They are mysterious and "moving" at the same time. That's just so sad. I couldn't and don't want to imagine the pain. Hugs sis! Hope you can check out my entry too. Thanks!